Huge Savings Item! Save 15% on the Craft Outlet Rustic Tin Pitcher, 19-Inch by Craft Outlet Inc at Home Decor Outlet Store. MPN: T0346. Hurry! Limited time offer. Offer valid only while supplies last. Craft Outlet Inc. 19'' Rustic Tin Pitcher. Rusty Tin Pitcher stands 19'' tall and is great for any floral arrangement or centerpiece. Craft Outlet Inc. Craft Outlet Inc. 19" Rustic Tin Pitcher. 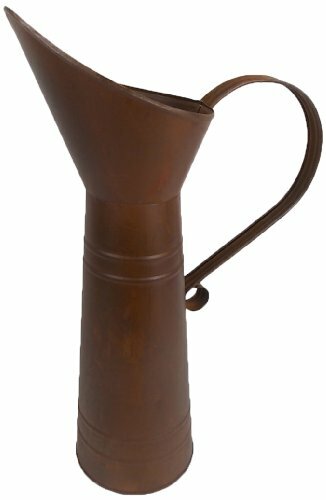 Rusty Tin Pitcher stands 19" tall and is great for any floral arrangement or centerpiece. Craft Outlet Inc. is a country and primitive crafts company that has something special for winter, spring, summer or fall. With an extensive product line varying from everyday decor and garden tins to decorative stars, plush and seasonal decor, COI certainly has something for you to accent your home. If you have any questions about this product by Craft Outlet Inc, contact us by completing and submitting the form below. If you are looking for a specif part number, please include it with your message.